Working with its established team and taking advantage of its successful strong niche positioning, Bridgepoint will provide the company with the resources to fulfil its growth ambitions and to expand internationally. A fourth vessel is scheduled for delivery in June 2013. The management, led by the co-founder Jean Emmanuel Sauvée and Véronique Saadé, will play an active part in this new stage of its development investing in the future of the company and contributing to the sustainability of the original concept. The company enjoys global market leadership by volume in the polar cruise segment thanks to the specialist nature of its vessels. It is also the clear leader in the French-speaking European market (France, Belgium and Switzerland). The luxury cruise market of the type served by CDP is a growing and resilient niche with global demand supported by an affluent customer base in Europe and the US that has been less sensitive to the macroeconomic environment. 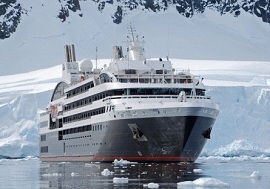 The polar cruise market in particular enjoys significant demand, yet capacity is limited due to the specialist nature of ships able to operate there. Meanwhile, Ponant says it has joined passenger shipping Association, the UK organisation that embraces both the cruise and ferry sectors.